It has been a long time since my last post. I have been getting over a big ish operation that to be honest just wiped me out. 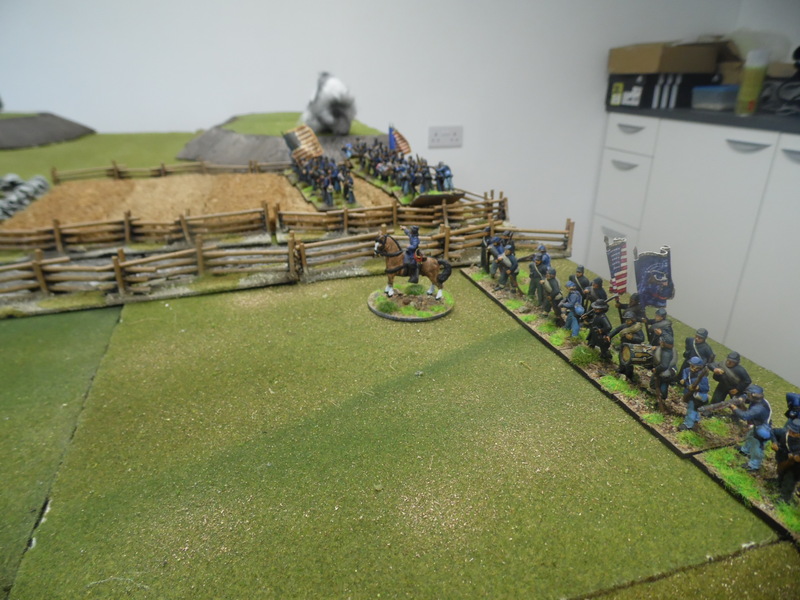 Anyway, finally managed to feel like playing a game so invited Steve and Laurie up for an ACW game. It was based on the forces detailed in the first part of this post and the terrain was similar to the map. 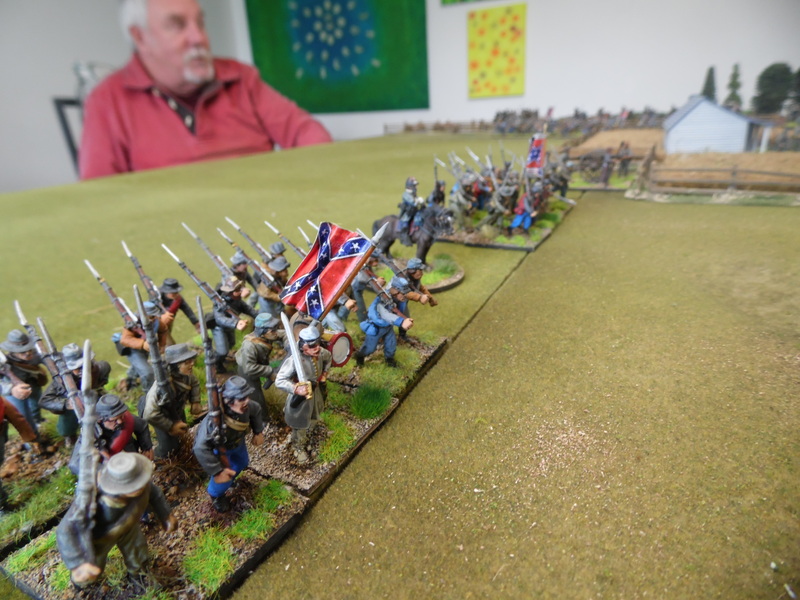 The background was that an initially numerically superior Confederate force was attempting to take a set of road junctions and hold-off expected Union reinforcements. 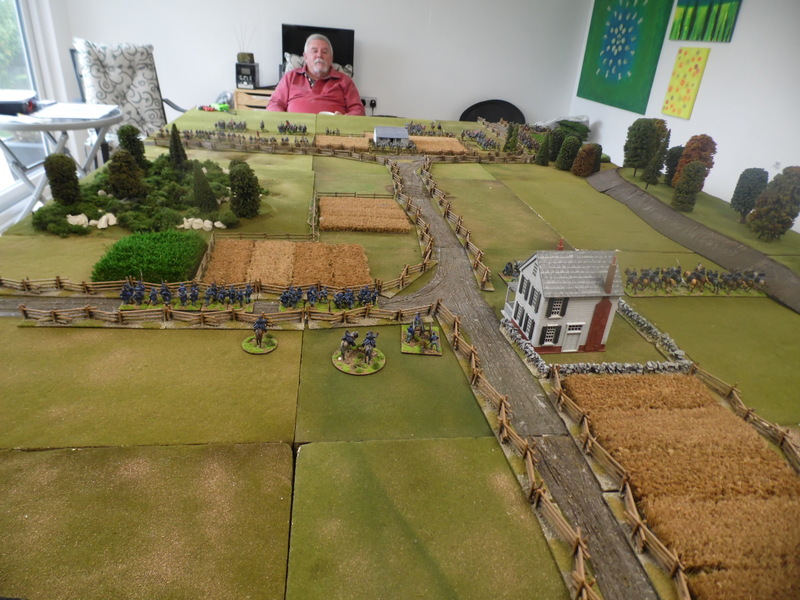 The rules we used were based upon the Fields of Honor set which we adapted to align with our house rules. 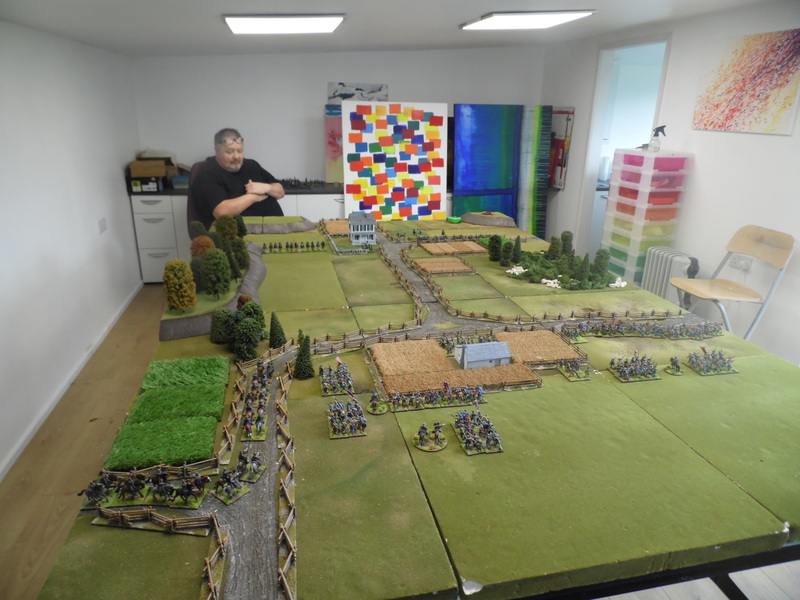 The main difference is that the original rules use D6 and in our initial trials we found that while the rules were OK for middle and later battles, the early years with units having lower morale and inferior weapons meant that they usually ran on getting their first casualties. The D10 we believe balanced these issues out perfectly. The view from the Confederate end. 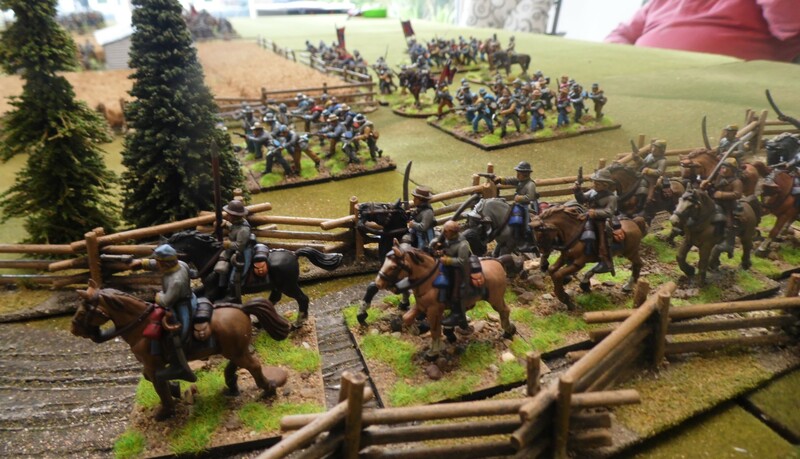 The confederate came on to the table and advanced up to the first set of rail fences and seemed to take up defensive positions to await the union onslaught. 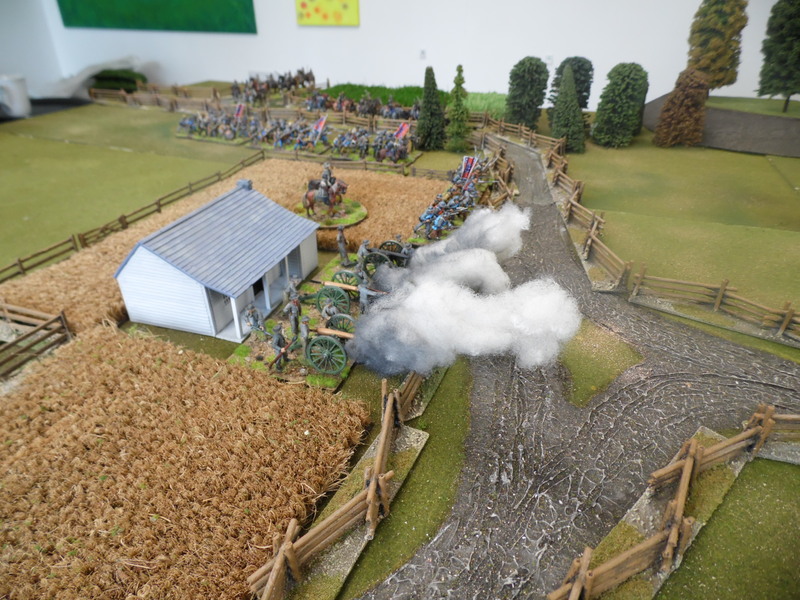 After a few turns trading artillery shots they realised that they may be better off taking the fight to the union. Meanwhile the few Union troops on the table anxiously await reinforcements! 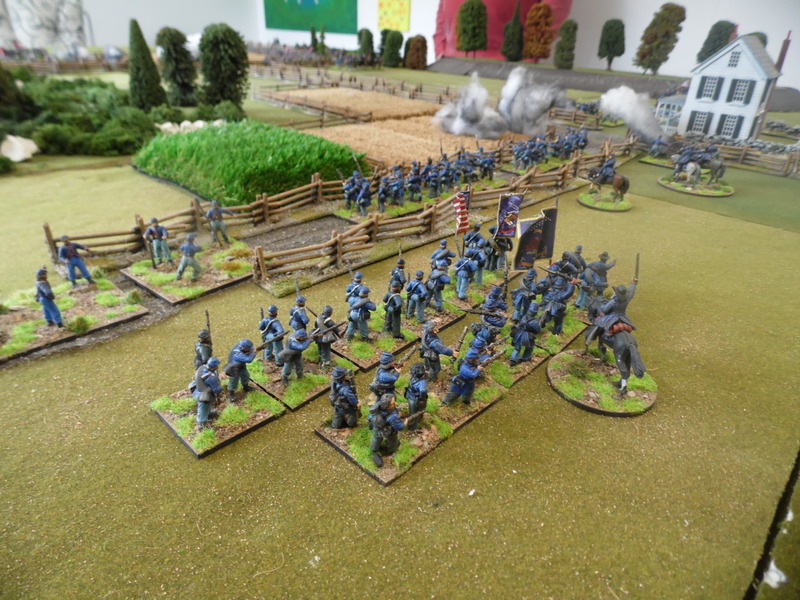 The delay by the confederates allowed the Union reinforcements to appear and have room to deploy. I have to be honest we then went for a bite to eat and sat chatting, which got the better of us. We returned to the game late in the day so I have left it set up for next time. Not much of a battle report but hope you like the photos. Having swore never to go in to ACW again. I have. 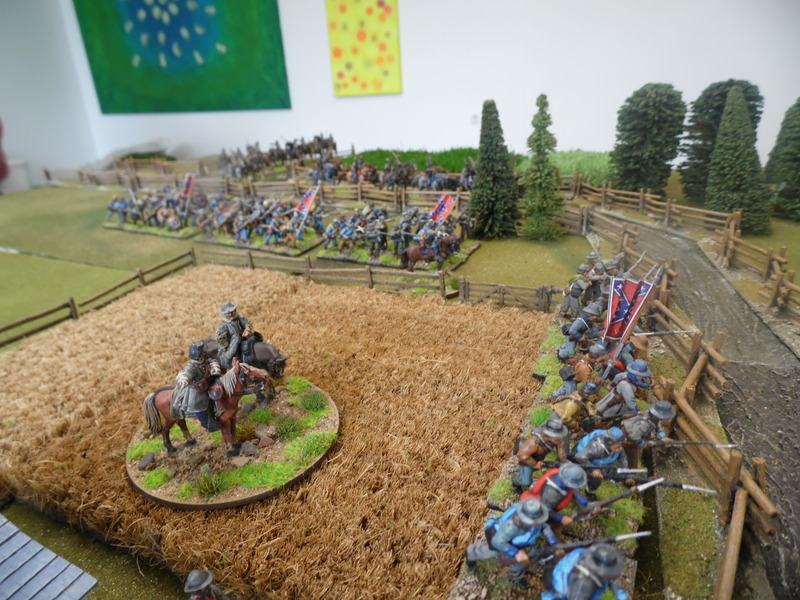 In previous expeditions into this era ,I started in 15mm then went into 25mm down to 10mm and back to 28mm before swapping my collection for the start of an English Civil War Army. I also have to admit that in all those scales I only ever played about 4 games. 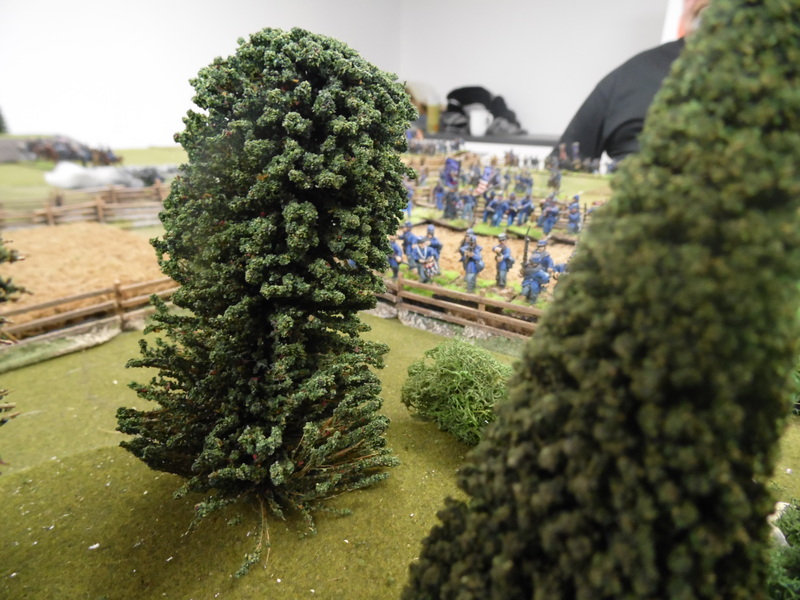 Having recently establish a small group of regular gamers who all have a liking for ACW I became tempted back into it. Therefore over the last few months I have been buying, painting and basing. The rules we will try will be our own lite version of the Fields of Honor, rule set. As with most new eras I go into, I like to pick a battle and start to build the forces for it. On this occasion I picked a rather smallish event, The Battle of Mill Springs also known as Logan’s Cross Roads, 19 January 1862. This battle has everything I like when starting a new era. It has a little of all aspects of the armies of the day. Infantry, Artillery, Cavalry, and dismounted cavalry. The terrain is interesting with roads, fields fencing, rivers, and woods. I will probably play this game on a 8×6′ table. Map and entrance positions below. Here are a few picture of the command I have painted so far. These are a mixture of Perry and 1st Corps. Although they fit as in scale wise, the quality of the Perry over the 1st Corps stands out. That said I do like the character look of the 1st Corps. The 1st Corps horses were great to paint as I just painted them a base colour and then once dry wiped them with oils. These were a mixture of Perry and Redoubt. While similar comments to the union command regarding quality are true, I do feel that Redoubt are slightly better than 1st Corps overall. As I finish troops I will add another blog.